Episode Summary: Many graduates recall their college experiences fondly, but few strive to give back to their alma maters as much as David Beazley does. Once a Wildcat wide receiver — credited with making one of the most memorable touchdown catches in Northwestern University (NU) history) — Beazley has a new playbook to follow. He is the founder and Managing Partner at Purple Arch Ventures (PAV), a private, for-profit venture capital fund for Northwestern alums (not affiliated with the University). In this episode, you will learn why David believes that Northwestern and its alumni in general will benefit from the investments as much as the individuals who will be directly involved in the deals. Subscribe to Founders and Funders on iTunes, Stitcher, Google Play, and Android Podcast Players. David has played a leading role in many aspects of the investment cycle: Structuring transactions as a fundless sponsor, improving operations as a consultant, leading management teams as a CEO, evaluating opportunities as an investor and advisor, and selling companies as a licensed business broker. Prior to Purple Arch Ventures, he founded Synergy Financial Partners, a private capital and consulting firm for entrepreneurs, PE professionals, and family offices. David earned undergraduate and graduate degrees from Northwestern, and he played for the two-time Big Ten Championship Northwestern Wildcats Football Team. He also serves on the NUvention and Kellogg Entrepreneurial Center Advisory Boards. David is the founder and Managing Partner of Purple Arch Ventures (PAV), a venture capital fund serving Northwestern alumni investors and entrepreneurs — all under the Alumni Ventures Group (AVG) umbrella. David Beazley caught the entrepreneurial bug after catching the football myriad times during a remarkable college football career. While going through Medill’s Magazine Publishing Project, as part of Northwestern’s Master of Science program, David got the idea to start a financial newsletter that targets high net worth investors and financial services professionals. Through the newsletter, he taught readers how to invest in alternative investment strategies including venture capital, later-stage private equity deals, and more. David eventually sold the business to a large media company and decided to focus the rest of his career around financial services. Former college athletes are naturally drawn to alumni organizations because they have proudly worn their school colors for many years. AVG has capitalized on that collegiate spirit by coupling it with a highly competitive industry that athletes thrive in — VC. Athletes are dedicated competitors, good teammates, and display strong work ethic. They also have an ability to overcome adversity, which is critical in this space. “To this day, I still haven’t done anything harder than three-a-day pre-season practices at Camp Kenosha with the Northwestern football team,” David says. At Purple Arch Ventures, David is striving to build a team that is “more than just a well-oiled machine.” AVG, David says, is disrupting an industry that invests in disruption. To be successful in that endeavor, the firm has created an easy underwriting process so that founders can complete their fundraise quickly and stay focused on their businesses. The PAV investment team participates in thoughtful portfolio planning, has a defined thesis for investing, and will not accept the status quo. “Successful entrepreneurs are becoming the new rock stars,” David says. “They’re certainly influential in business, but they’re also influential in culture.” So as Purple Arch invests in alum-connected companies and highlights the successes of the founders they fund, he believes PAV will become a beacon for investment dollars as well as for donations to the university in general. In the same way that donations to a school increase when a basketball team plays well or a football team goes to a bowl game, entrepreneurs will become a mirror of the greatness of a university like Northwestern and a school funding magnet. Having literally bled for his school, David is a proud Wildcat alum who truly believes that the best way he can give back to the university who gave him so much is by supporting entrepreneurs who also attended the school. By raising their rounds and visibility, today’s founders may be the inspiration others need to attend Northwestern, donate to the school, or invest in the thriving NU-connected entrepreneurial ecosystem. Sign up for the Purple Arch Ventures fund newsletter for more insights into how Northwestern alums are investing together. You may also want to sign up for the Alumni Ventures Group newsletter to learn more about all of the alumni and focused funds at the company. Learn more about the Purple Arch Ventures Deal Team and connect with David Beazley on LinkedIn. 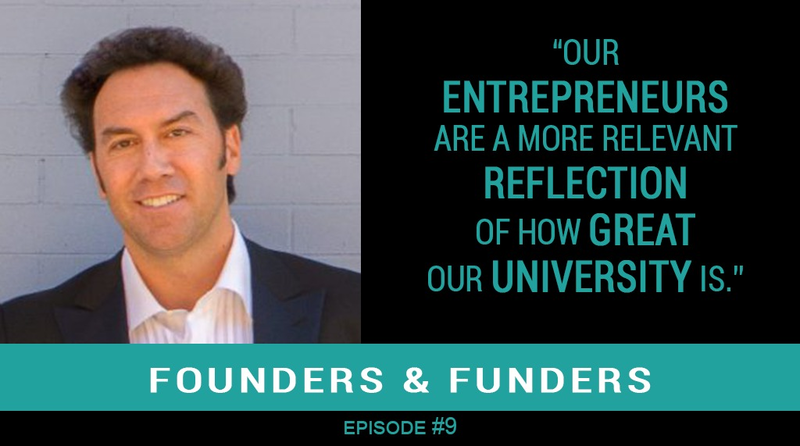 Founders and Funders is a podcast where we discuss how entrepreneurs and investors work together to build great new companies. Our guests — many of whom are connected with AVG as entrepreneurs, investors, managing partners, fellows, and more — are invited here to talk about the journey of building companies from incubation to early stage investing and beyond. Subscribe to Founders and Funders on iTunes, Founders and Funders on Android, Stitcher, and other popular podcast channels to find more fascinating stories and insights from the entrepreneurs and investors who comprise the Alumni Ventures Group community. The disappearance of Malaysia Airlines Flight 370 and the ensuing confusion deeply troubled Payam Banazadeh, a Stanford grad and former NASA satellite engineer. So he created Capella Space. Suzanne Biegel (founder of Catalyst at Large) joins Gail Gilbert Ball (Managing Partner of AVG Women’s Fund) to discuss how investors can back socially conscious entrepreneurs while making a profit. In this segment, Founders & Funders producer Ryan Burleson tells the story with help from Mike Collins and Green D’s current investment team, Managing Partner Laura Rippy (D’89) and Partner Lacey Johnson (Tuck ’13).